VPI PAD-GRA20 Initial Deep Scrub Pad 20" - Micro Parts & Supplies, Inc. Description: Using the VPI ESD Initial Deep Scrub Pad (gray in color), agitate floor thoroughly with a low speed rotary machine or automatic scrubber. 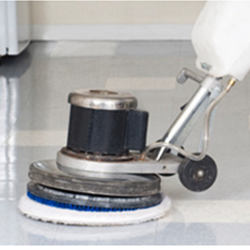 Approximately 5 passes are required to properly deep scrub the floor. Make sure floor remains very wet. NOTE: Place a "floater pad", such as a standard red pad, underneath the VPI ESD Initial Deep Scrub Pad (gray in color), before beginning the scrubbing process. This will enhance cleaning. Both sides of pad can be used.